My hands are broken but they still write. I like the feeling of dreaming. to kiss my clothes off. and the yes that you take from my lips. I like the feeling of take me away. I like the feeling of wander. I like the feeling of smoke replacing the air in my lungs with numb. a prayer against a lie. knocking on walls in a 5×8 closet in a school for the deaf. they look like my teeth but a bit less red. when I’ll walk through streets my feet can feel safe in. but I like the feeling of breaking. but I can respect the process. 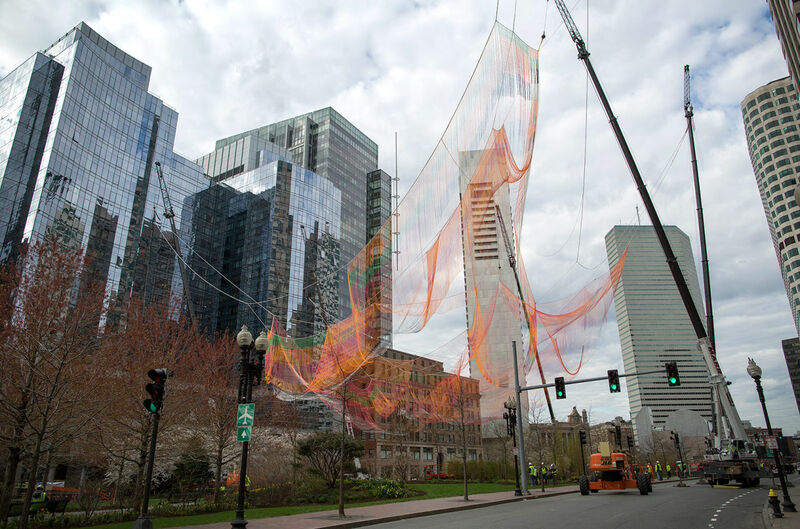 This was erected over the Rose F. Kennedy Greenway in Boston last spring. Articles were published in which the authors referred to it as “the most beautiful thing they’d ever seen”. I had a different reaction. While I’ve developed a certain appreciation for the work since writing this poem, I am still out of line with the artist’s supposed intention, which still leaves something to be desired, in my opinion. I don’t want to be confused. as if that doesn’t speak for itself. Your homage to a fleeting moment. Yes, this is where our city is, now. constantly creating in this moment you call now. I weave the threads of time into the future. men with desire for dominance. and replace it with, “Sorry”. the language of white terrorists. because that’s what the drugs were designed for. with the guilt and the shame of their silence. to the regret corroding their veins. would never come back to me. I am humbled in the presence of books. only these books can’t hurt me. These books can’t pretend to be truth when they lie. unless by my own choice. and are still there when I wake up in the morning. Deception is a hell of a good time. when I know what I’m coping with. with nights I’ve survived to write about. the morning after you’ve been choked? you’ve learned to call every day? could it really be worse? the first night you felt safe enough to sleep through? It feels like feeling all over again. It feels like fast forward stuck on rewind.